Ransomware is a type of malware aimed at locking users' data and demanding a ransom fee in return. The SnakeLocker ransomware is a threat demanding for a ransom, but, fortunately, not capable of locking the whole system. All that it is capable of is encrypting only relatively irrelevant information the loss of which would not lead to long-term damage. Like many other ransomware infections, the SnakeLocker ransomware infection displays a warning, which says that the victim has to pay a fee of 0.1 Bitcoins to regain access to data. A ransom note is also created in a .html file, which is named INSTRUCTIONS_README. Malware researchers believe that the SnakeLocker threat is in its developmental stage, thus such unexpected performance on the targeted computer. Nevertheless, the infection should be removed from the computer, and interested readers are encouraged to continue reading so as to find more about this ill-purposed software. The SnakeLocker ransomware does encrypt files, but the files selected by the attackers are stored in, for example, the directories %LOCALAPPDATA%\Google\Chrome\User Data\[USER PROFILE]\Extensions or, for example, %APPDATA%\Microsoft\Windows\Cookies. The fact that the infection aims at encoding only Internet browsing-related files implies that this piece of malware is just a testing version. According to the ransom warning displayed by the ScakeLocker ransomware, the victim has to install the Tor Browser and access the URL given to find ransom payment instructions. However, the website given by the fraudster is not accessible, which again makes researchers believe that the SnakeLocker infection is not as serious as many other damaging ransomware threats. On top of that, the distribution map of the SnakeLocker is considerabily fairly small. Moreover, the infection seems to fail in communicating with a Command-and-Control (C&C) server, which is the case with damaging ransomware infections. It is highly advisable to ignore the demand to pay a release fee in the Bitcoin digital currency, since submitting the money is no likely to change much. Instead of following the attackers' instructions, you should remove SnakeLocker from the computer. 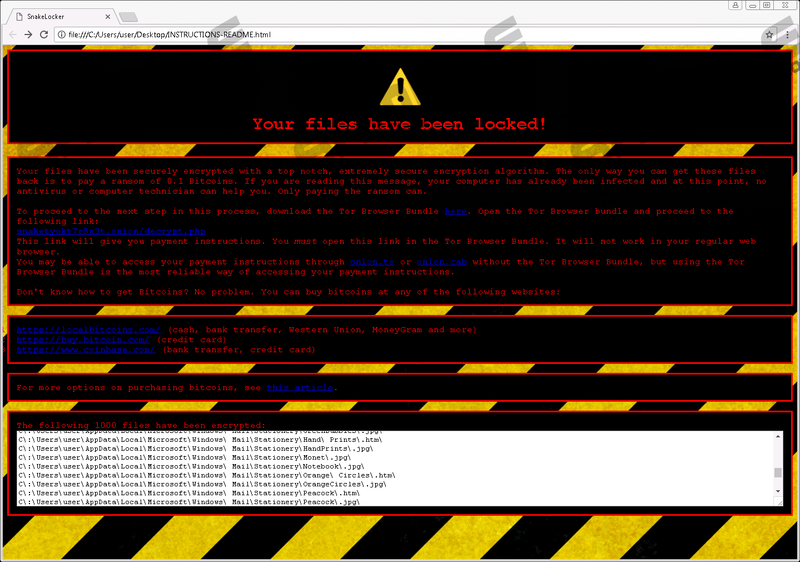 The SnakeLocker ransomware uses AES encryption to encode files. Afterwards, the AES key is encrypting using a RSA encryption algorithm. Due to the fact that no communication to a C&C server has been found, the key is likely to be generated locally. Usually, when ransomware encrypts files, their filenames are altered by appending an additional extension. In the case with the SnakeLocker ransomware, two samples of the infection has been detected, both of which add different extensions, which are .snake and .tgif depending on the variant. The SnakeLocker ransomware is built using the Phyton coding language, which is considered to be an easier option for both experienced and first time programmers, as opposed to other more complex programming languages, such as C++ or Java. The Phyton language is widely applied, and the range of application varies from web development and mathematical computing to desktop graphical user interfaces. The attackers behind the SnakeLocker remain unidentified, but the odds are that someone is extremely interested in profiting from inexperienced computer users. If you want to be secure on the Internet, you should always be aware of the threats circulating on the Internet. An unprotected operating system is highly appreciated by online schemers, since they can get access to your personal data and take control over it. In order to prevent ransomware and other threats, you should browse only reliable websites and install software that is safe and reliable to use. Moreover, it is important to disregard spam emails and various pop-up advertisements that you face while surfing the Net. Keeping the operating system and software updated is vital, as well as having a reputable security program. It is possible to remove the SnakeLocker ransomware manually, which, in the present case, means that it is enough to delete a few files created by the infection. However, there are many infections that creates multiple malicious files and registry keys, the latter of which have to be dealt with very carefully so as not to accidentally delete components relevant to system performance. Our instructions below should help you terminate the SnakeLocker, but if you have any questions regarding the removal of the ransomware, feel free to comment below. Open the Task Manager and kill the malicious process. Delete the file associated with the process. Quick & tested solution for SnakeLocker Ransomware removal.